If you’re in need of a ‘last quarter of the year’ refresher, then the Sydney Festival of Dreams from the 7th - 9th October is the event to mark in your diary. Taking place at the Hordern Pavilion, Sydney, it’s the third consecutive year of the organizers hosting this chilled event. This is not a pyramid scheme, nor a Tony Robbins ‘clap with the crowd’ type of festival. It’s a really well balanced weekend where all ages, faiths and cultures learn to reset their default button and remember the good on the planet…and what you can do to be part of it moving forward. The event is also not a typical spiritual and mind, body, soul soiree but more focused on interactive seminars and workshops that boost your chakras and get the chi running back to normal. The workshops, seminars, presentations and music are in abundance and each year, there’s an annual theme focus. 2016’s is called the ‘Great Australian Dream’ with celebrity speakers that will help you restore a better sense of good intentions for the future - which is also the present. The organizers make it clear that attendees are not interested in wishy-washy entertainment, but are intelligent, focused, and possibly successful yet simply need a solid supersized smoothie of reinforcement. The focus is about reinforcing the backbone attitude without the stereotypical hippy, lentil eating, sandal wearing, tie-dye t-shirt persona. There are around 100 exhibitors to keep you in full swing throughout. From organic perfume sprays by Altearah Bio to Dreamtime Healing’s holographic kenetics and Kyobe Art original paintings to Teapot Teas. The exhibition range is vast and we’re impressed with the caliber of showings on offer! One particular attraction really caught our eye – the Chill Out Igloo. It’ll include various activities including aerobic classes, yoga and meditation. Or you can just sit inside it and decompress for a while by yourself while you restore your anahata (Google it). Ticket prices range depending on whether you’re looking to attend one day, one event or the full shebang. Daily admission prices are reasonable at $20 (including an inconvenience fee of $1.89) to around $75 for early bird specials. Only 25 minutes by car or 45 minutes by public transportation north, you’ll be back at our own oasis of a Manor at Cremorne Point. 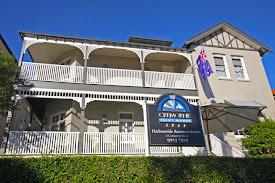 Set in a tranquil and idyllic environment, you’ll easily be able to maintain inner peace from the weekend while you’re staying with us at Cremorne Point Manor. No downtown bustle, absolutely no overpriced tourist hotel rates and categorically no loud bars or restaurants nearby. The only sound you’ll hear is the lions roar from nearby Taronga Zoo while they’re also taking it easy, with yawns in between naps. Bliss!